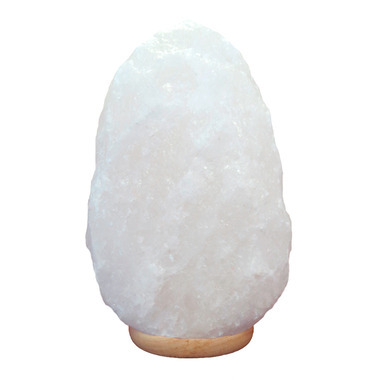 The Lumiere de Sel Natural Shape Himalayan Salt Crystal Lamp uses beautiful salt right from the Himalayan Mountains! Ideal in your home or work place, this natural ionizer reduces the amount of positive ions in your environment, providing cleaner air and a healthier atmosphere. Increase the tranquility in any room by adding the natural, warm glow that this lamp produces. Composition: 100% Himalayan Crystal Salt with a wooden base. Bulb and cord inside. Includes 1 bulb. Dimensions: Each Salt Crystal Lamp is unique! Sizes will vary between 5.5 lbs. (2.5 kg) and 7.7 lbs. (3.5 kg). Do not use this lamp in rooms with excessive humidity, or outdoors. Always follow the instructions included with this product to ensure proper use and safety. Love the white lamp, so easy to put into any space. Came with a blue bulb which was a bit strange, but I ended up changing it to an LED bulb anyways so not a problem. The lamp itself is so nice and white but it came with a GREEN bulb!! I had to go out and purchase a new bulb in order for it to be a white light.. I like the lamp itself a lot however, the light bulb that came with the lamp is green, so the light comes out green. I've gotten used to it but I would of liked a white or yellow light. I love this lamp - and have 2! The second one shipped without a power cord but well.ca remedied that quickly and easily. Has a cheap base and not as steardy but is a decent size. Poor packaging as the light bulb floats around in the box and was shattered upon delivery. Nice, soft, pleasant white light. The salt is a decent size for the price. However, the bulb is cheap, I have to fiddle with it a lot. Overall happy with the purchase and will be ordering another for another room. Arrived quickly, well packaged! Its lovely, about 4-5" high and sits nicely on my sons dresser. Gives off a warm soft glow. I like the look of this lamp in my living room. It comes with a blue bulb so it gives a nice greenish glow at night. Perfect addition for my Himalayan collection. The salt lamp is beautiful. The color white is really nice. Although, I am not too pleased with the size of the lamp. It is smaller than expected and they came both with green lights. It is a bit inconvenient but the lamp itself is worth it! love it. I gave it a 4 star because I received the lightbulb broken in million pieces. However I added a white lightbulb and it is really zen and recommend a white bulb. The description says white salt lamp, while the colour of the salt is actually white the light for the lamp is green. Looks very odd but my kids love it. This is my 4th salt lamp but my first white one. I got salt lamps from different sources and the quality of this one was fine. Normally white one is more expensive (than the pink), so I purchased it when it's on sales. I guess the only major issue could be you don't know what kind of color of the light bulb you may receive (although the quality of the bulb is nice compared to other sources). I receive a blue one (it's more like pale green blue when it's on) which also happens to the color I'm hoping to get. Expect to buy a light bulb in case you receive a different color than what you want. Wish to get a bigger one from the same source if available. These Himalayan salt rock lamps are amazing. This white rock lamp comes with a blue bulb, it gives off a very nice calming glow, perfect for my sons bedside. I love the benefits of the salt lamp. My lamp came with a blue bulb which I was a bit surprised at. I will go buy a warm white bulb for the lamp at some point. But even unplugged the lamp still offers beneficial qualities to the space it's in. I love the white as well. I was really surprised after reading the reviews at how big the lamp was. I think the price reflects the size quite fine. However, I was a bit disappointed that it came with a red light bulb instead of white so I will have to replace it. I guess that is a personal preference but red light isn't all that relaxing in my opinion. Overall I'm pretty satisfied with the product, and as always very satisfied with well.ca.